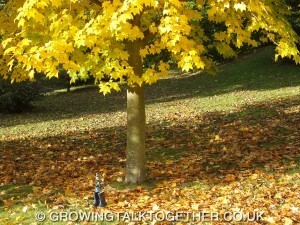 What an amazing season for “Growing Talk” Who can resist jumping and kicking in the leaves ? What else will your children notice when they are out and about? 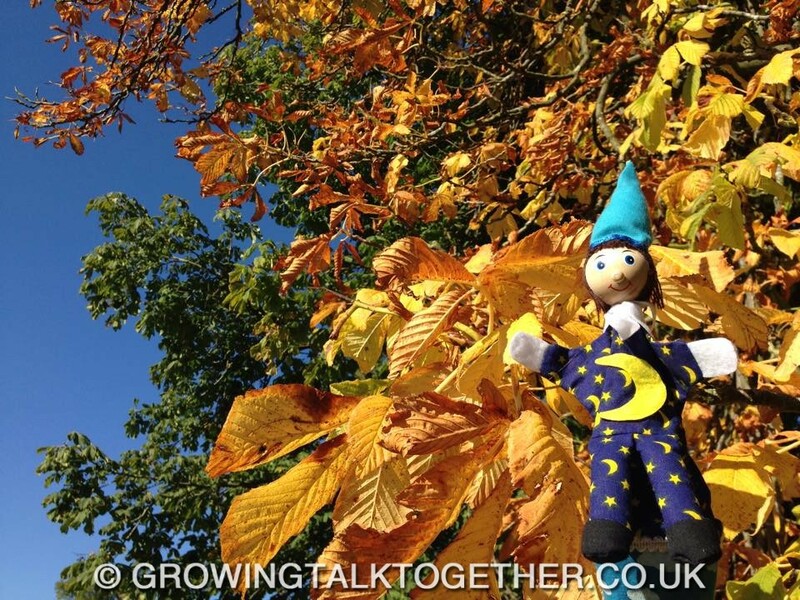 Will it be sticks and trees, the amazing colours, the leaves, discovering a Horse Chestnut tree and cracking open conkers, or finding tiny acorns underneath an ENORMOUS Oak tree. Where are the nearest trees to you? 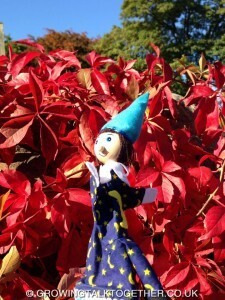 In the park, on the side of the road or is there somewhere you can go on a woodland walk or an adventure into the forest? Maybe you will go on a Bear Hunt! Take a bag or box for your children to collect things that interest them, an egg box is great for tiny hands, can your children find something for each section? 6 different leaves, 6 different coloured leaves, 6 different items? 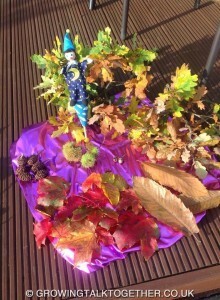 A conker, pine cone, acorn , twig, apple, berry, blackberry, red leaf, yellow leaf, orange leaf, green leaf……. 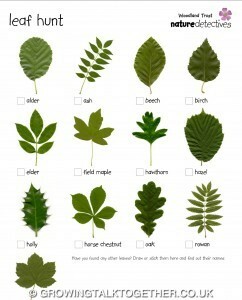 Will they choose to collect leaves , will they select all one colour, or a mix? Then of course we had fun jumping, in them! We had a competition to see who could throw them the highest, and then we watched them float and flutter as they fell back down ! And of course we made up our own song to help us remember and practice all these new words! Conker fun! Conker collecting is an annual favourite at Mikey’s house, but it’s much more than just the traditional conker fights! 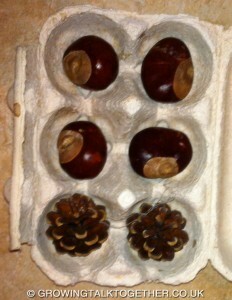 NB : Be careful if sharing conkers with very young children they must not be swallowed or eaten! Conker counting –Who collected the most? Who can carry the most! 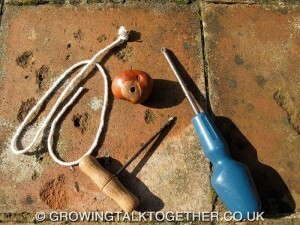 Conker number strings – a natural abacus! 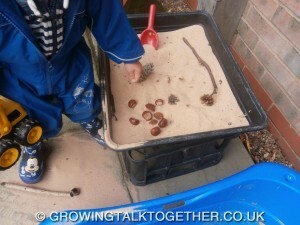 Conker caterpillars, worms and trains! 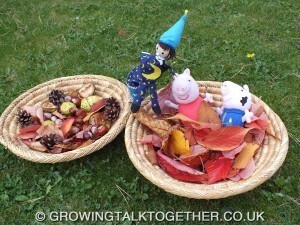 How many creative things can you find to do with conkers? Make sure you have all the necessary tools at the ready and lots of string! 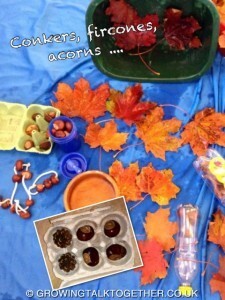 Listen to the sound of conkers falling… onto the ground, into different containers, into water. Make a shaker by filling plastic drink bottles with leaves, conkers or acorns . so they can be rediscovered ! 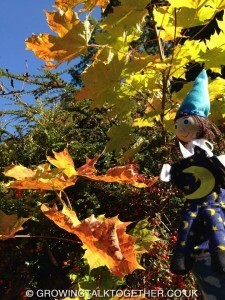 Check out their new #NatureDetectives weekly challenge! 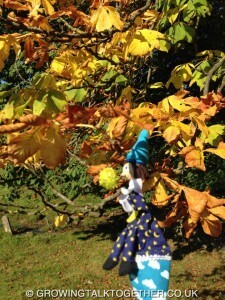 They have a brilliant autumn challenge for you this week – Kooky Conker Models!! Have fun 🙂 and please share in the comments section any activities you have enjoyed and as always any new words used!